Amir Khan insists his dream fight against Floyd Mayweather is not on his mind ahead of Saturday's bout against Devon Alexander in Las Vegas. The winner of the welterweight showdown could fight unbeaten five-weight world champion Mayweather next year. 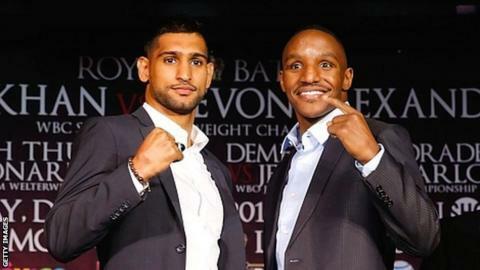 However, Britain's Khan has been promised a fight against Mayweather before, only to be disappointed. "Winning this next fight could lead to a massive fight but I'm not looking past Alexander," said Khan. "I've made that mistake before with fights I should have gone in and won. I'm 28, still learning and still hungry. I just have to pace myself and take my time." Khan has endured a frustrating year, with American superstar Mayweather choosing to fight Argentine Marcos Maidana twice instead and a scheduled fight against Alexander, who was then a world champion, falling through. And Khan, who returned from a 13-month lay-off with a points win over veteran American Luis Collazo on his welterweight debut in May, is still keen to make the Mayweather fight happen. "Every fighter in the welterweight division wants that big fight against Floyd and as a hungry fighter you want to fight and beat the best," said Khan, a former world champion at light-welterweight. "Some styles cause problems for Floyd and some styles are made for him. You never want to leave boxing thinking what would have happened if I'd fought someone like Floyd." Meanwhile, Khan's American promoter Oscar de la Hoya believes his charge has the talent to become one of the all-time greats at 147lb. "The bigger the fight, the bigger the prize, the more Amir rises to the occasion," said De la Hoya, himself a six-weight world champion. "Alexander is a very talented, very durable boxer but Amir is in the perfect place to fulfil his talent now. "But it annoys me that Amir keeps being promised his turn for a major fight and it doesn't happen." Philippine great Manny Pacquiao has thrown down another challenge to the 37-year-old Mayweather, who is scheduled to fight next May. "If Floyd doesn't meet Manny then I believe his only other option is to fight Amir," added De la Hoya.